Stability & Sustainability in Banking Reform: Are Environmental Risks Missing in Basel III? In 2014, UNEP FI undertook a research project on Basel III and environmental risk in collaboration with the Cambridge Institute for Sustainability Leadership (CISL), the Banking & Environment Initiative (BEI) and supported by Bloomberg LP. 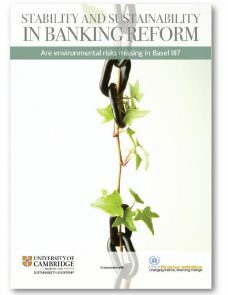 The result of this work has been the release of the report Stability & Sustainability in Banking Reform: Are Environmental Risks Missing in Basel III? which explores the role that financial – and in particular banking – regulation can play in the transition to a green economy. This study comprises a series of recommendations on how to optimize the way existing financial policy and regulation is deployed so as to achieve financial and environmental sustainability goals. In particular it analyses whether the Basel Capital Accord (‘Basel III’) adequately addresses systemic environmental risks in the context of its overriding objective of banking stability.